Heat oven to 350°F. Grease 1-quart casserole. Cook rotini to desired doneness as directed on package. Drain. Cut each meatball in half. 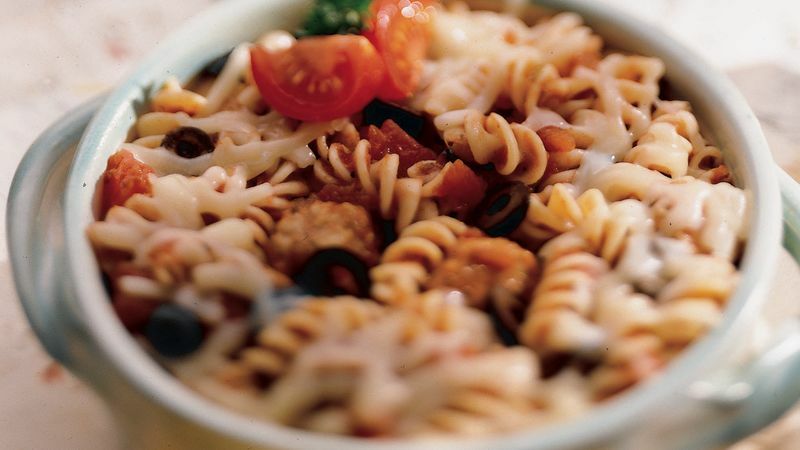 In greased casserole, combine meatball halves, pizza sauce, olives and cooked rotini; mix well. Cover. Bake at 350°F. for 30 to 35 minutes or until bubbly. Uncover casserole; sprinkle with cheese. Bake, uncovered, an additional 5 minutes or until cheese is melted. Use any flavor or variety of pizza sauce in this easy casserole. To make this casserole ahead of time, prepare it as directed except for the cheese. Cover and refrigerate it for up to 24 hours; bake it for 40 to 45 minutes, adding the cheese as directed in the recipe.